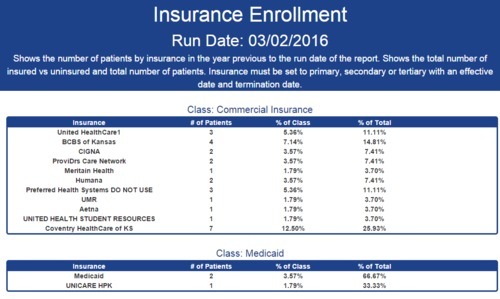 The Insurance Enrollment report is an Advanced Report which displays the number of patients by insurance in the year previous to the selected run date of the report. The report will show the total number of insured vs uninsured patients and the total number of patients. Note: For the report to pull information, a patient's insurance must be set as a primary, secondary, or tertiary insurance with a start date. The report will group insurance companies by insurance type/insurance class, e.g. Commercial Insurance. Insurance — Name of the insurance company. # of Patients — Number of patients who have that insurance active. % of Class — Number of patients with that insurance company / total number of patients with an insurance company of the same class. % of Total — Number of patients with that insurance company / total insured patients.